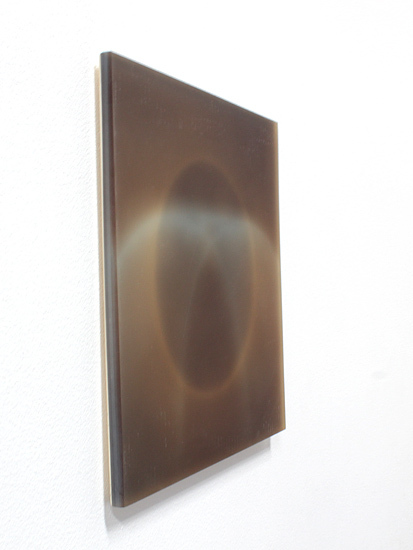 I exhibited works by Helen Pashgian in the group show Translucence, presented at the gallery in the fall of 2013. 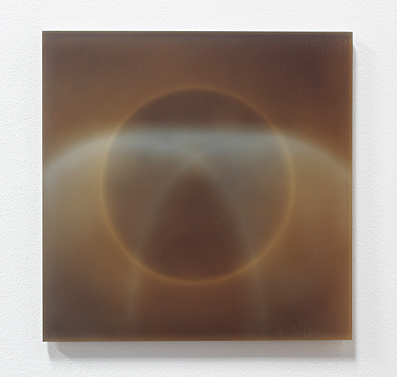 The work pictured here demonstrates how Pashgian’s work has explored the new possibilities offered by industrial mediums to manipulate and explore visual and perceptual phenomena. Dating from the early 1970s, this piece traps, reflects, and diffuses light, much like the columns that will soon be on display. As you move around the piece, colors and shapes seem to advance and recede, which contributes to its perceptual ambiguity. The traditional boundaries between form and color dissolve, leaving the viewer with a subtle, shifting sense of space. The current exhibition, Roseline Delisle, is an unusual opportunity to see so many of the artist’s works displayed together. 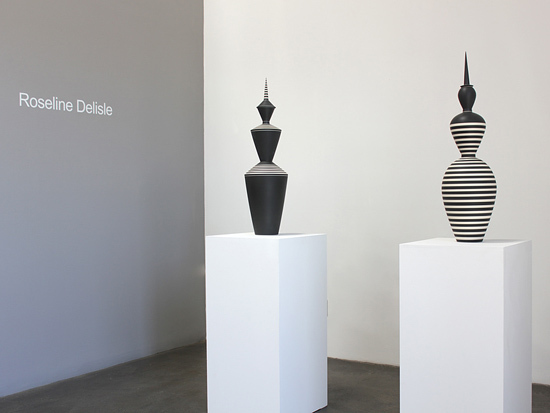 The show spans two decades of her career, and illustrates Deslisle’s development of progressively larger forms. The rarity of her work on the market has led to a lot of questions from visitors, some of whom are experiencing Delisle’s work for the first time. Roseline Delisle’s work was avidly collected by private individuals and major museums during her lifetime. For example, the Los Angeles County Museum of Art owns seven Delisle artworks, including the 1997 piece 8=1 (to the third power), which was purchased in 1998 with funds provided by the Friends of Clay and Decorative Arts Council. The Metropolitan Museum of Art, New York, owns two beautiful works as well. Delisle’s work is also represented internationally. In her native Québec, the Musée des Beaux Arts, Montréal, owns a beautiful bowl in the artist’s signature cobalt blue. The Tokyo National Museum of Art also has in their collection two Delisle works from 1988. 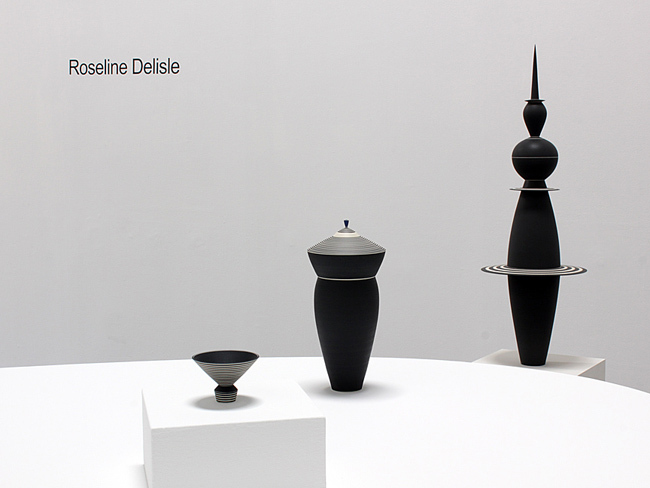 Altogether, Roseline Delisle has works in nearly twenty major museums around the world. The opening reception for Roseline Delisle last Saturday was a bittersweet moment for the gallery. It had the feeling of a reunion, as friends and family of Roseline and her husband, Bruce Cohen, filled the space. Spanning two decades of her career, the sixteen works on display demonstrate Roseline’s commitment to her aesthetic vision – they grow larger but maintain her characteristic precision and elegance. Vertical vessels, composed of stacked cylinders that interlock seamlessly, Roseline’s work is almost mechanical in its exactitude. 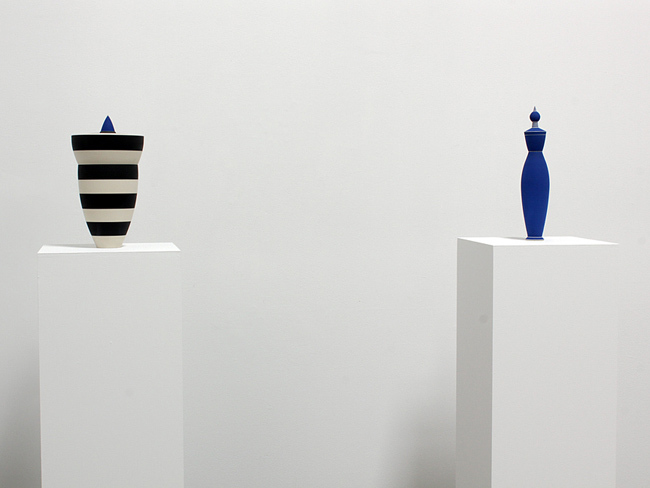 A strict color palette of blue, black, and white is made infinitely variable through her use of horizontal striping. Yet for all its austerity, her work never crosses over into the severe, as her forms refer to the figure. With foot, body, waist, and head, her vessels have a human presence. When installed in groups, these figures form families. Roseline’s belief in the power of a beautifully designed form ties her work to that of Kasimir Malevich and Oskar Schlemmer, whom she cited as important influences. Her work feels as fresh and modern now as it did when it was made. It never occurred to me that my career would last this long, but I was recently struck by the fact that I’ve spent the last 29 years perfecting a specific idea. When I ask myself how I’ve stayed with it for so long, I remember a dream I had many years ago. I dreamed I was walking down a long road and that the road was my work. The sun was setting at the end of the road, and all I had to do to get to this exquisite sunset was keep walking.